Winter has arrived, the temperature is less than 6° and tomorrow it will still fall. I spend my time at home between good news and bad news. The good news are always about what I want to achieve. The bad news are always about what I actually realized: very little! 11.30 a.m. : work until 13.00 a.m, possibly full of energy and focus! The day is completed with good news and ... "bad, bad, bad" news! The good news: the third season of Misfits will begin on the TV in the month of February.YAYYYY! The terrible news: Nathan Young will not be in the third season.Oh, noooooooo!! I would like to say no more. Dear actor which interprets Nathan, I want to know WHY-YOU- WENT-OUT-OF-YOUR-MIND and you leave your character! Millions of people (me,myself and I) are in love with Nathan, and I ask to me why do you leave us in this way. If I were you, I'd run to sign the contract for the fourth season. After all you're just in prison in Las Vegas. After all you have only cheated at the game at the casino. And then you have superpowers! 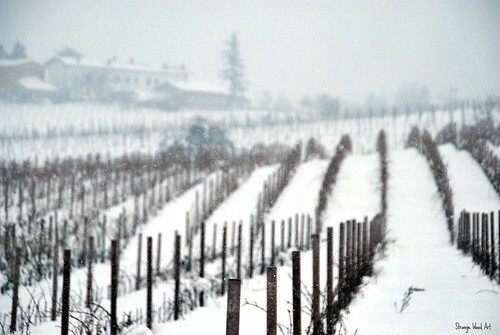 L'inverno è arrivato, la temperatura è inferiore ai sei gradi e per domani scenderà ancora. Io passo il mio tempo in casa, tra buone notizie e cattive notizie. Le buone notizie riguardano sempre quello che vorrei riuscire a fare. Le cattive notizie riguardano sempre quello che effettivamente realizzo: ben poco! ore 11.30: lavorare fino alle 13 piena di energia e concentrata! La giornata si completa con buone notizie e... "brutte, brutte, brutte" notizie! La buona notizia: la terza stagione di Misfits inizierà entro il mese di febbraio.Yahoo! La terribile notizia: Nathan Young non sarà nella terza stagione.Noooooooo!!!!! Caro attore che fai Nathan in Misfits, io vorrei sapere perchè sei andato fuori di testa e lasci il tuo personaggio. Milioni di persone (io,io stessa e me medesima), sono innamorate di Nathan e tu ci lasci in questo modo?Fossi in te, io correrei a firmare il contratto per la quarta stagione.ORA! Dopotutto sei solo in prigione a Las Vegas. Dopotutto hai solo barato al gioco al casinò. E poi hai i superpoteri! 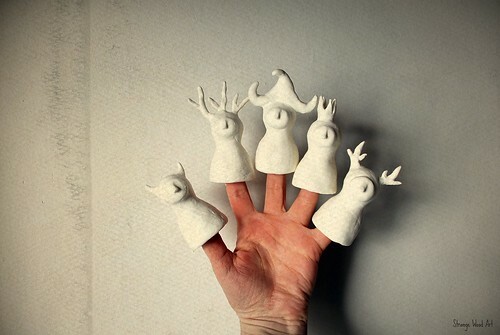 your fingerpuppets look wonderful even white at the moment. I can imagine how fun they will be after you'll paint them! Having friends like you, makes my day and that's enough! Misfits è una serie che parla di teenager, quindi io sono fuori dalla fascia di età.LOL!E' abbastanza "forte" il linguaggio usato, ma io adoro gli scenari inglesi, molto alternativi, c'è una fotografia splendida. Dovresti guardare le puntate dalla prima stagione, perchè se ne perdi una , perdi particolari importanti per seguire il resto. E poi da dipendenza!! !...Non si riesce a de-Misfits-icarsi. Your finger puppets are really expecial!!! 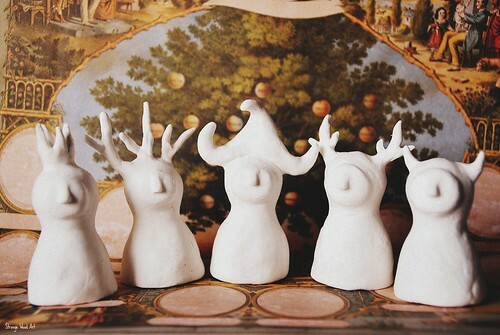 I'm waiting for to see them painted!! p.s. I'm sorry but I don't know Nathan and Misfits!! You....lucky girl!!! :-)Youìre out of the tunnel. Ahahaha! Ciaooo! non conoscevo la serie....merita? e il caro Nathan? mi informerò! Neanch'io conosco questa serie ma adesso mi hai incuriosito!!! Quante volte anch'io faccio piani che poi non riesco a mantenere per un motivo o per l'altro!! Che nervi!! I finger puppets saranno sicuramente stupendi una volta finiti!! ps: molto belle anche le prime due foto, le hai fatte tu!? Sì le foto sono our production! 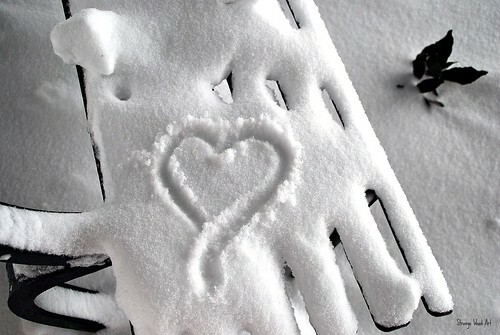 Il cuore nella neve è molto poetico! Ti piace?Io faccio sempre cuori...nella neve e nella sabbia, mi piace! Grande Linda!!! i finger puppets sono stupendi!!!!!!!!!! Ho letto che Alysha e Curtis hanno twittato che non faranno la quarta stagione...Ma basta con questi abbandoni!Però in compenso Nathan ci rientra dalla finestra nella quarta (forse)...Sììììììììì! Speriamo adesso smetta, però...sta creando molti disagi! E comunque il giusto è sempre meraviglioso! Ho sempre così tante cose da fare che non so quando li terminerò...spero entro la prossima settimana!Grazie per la visita! Grazie per avermelo fatto sapere, sei bravissima, come sempre! I do agree with all the ideas you've presented in your post. They're really convincing and will definitely work. Nonetheless, the posts are too short for starters. May you please extend them a little from next time? Thanks for the post. This is a blog mainly created to show my artworks, as a support to my work as artist. To not bore any of my friends and do not become this space only about my publish photos, I like to say something more beyond my work.But without any pretense from me, or pretense from anyone. It 's just my space that I choose to share, and for now I like it in this way. Thanks for writing me and letting me know your opinion.